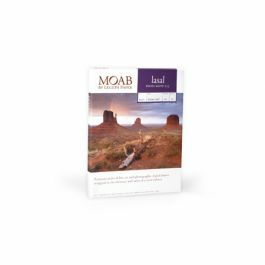 Moab by Legion Paper 5x7 235gsm, alpha-cellulose, double-sided, bright white, smooth matte. To avoid printer damage, check your printer user manual to ensure it can print paper of this weight. Lasal Photo Matte 235 by Moab Paper is a double-sided professional grade of photo paper featuring excellent image sharpness and good color density. Lasal Photo Matte 235 features an instant-dry smooth matte surface. These papers are universally compatible with the widest range of printers and ink sets but reach maximum longevity with today's archival pigment inkjet printers. Lasal papers can be laminated with both hot & cold presses and is perfect for general photography, portraiture, presentations, posters, graphic art reproduction, as well as indoor and outdoor signage*. *Legion Paper recommends laminating this sheet if used for signage.